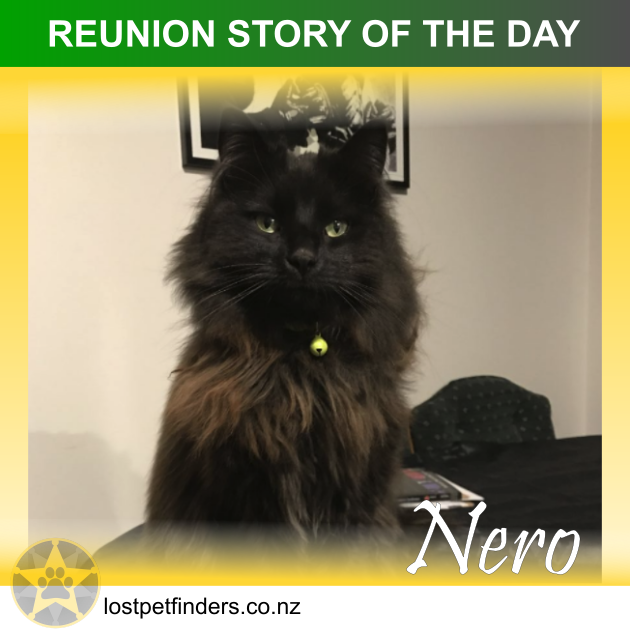 "I had Nero for 2 years, and recently moved to a new place only a couple of km away from the old place, so was worried Nero might head for home. He seemed very settled after a few weeks, even coming in and out at night. It isn't unusual for him to stay away all night and all day, only coming home to eat. However, after a couple of nights I got worried, and began a routine of walking the streets at 6am every morning and again after dark each night, calling and calling. I posted on as many local facebook pages as I could, and the messages and shares from complete strangers warmed my heart. There are a lot of kind people out there. I went back over the same locations a couple of times, and this paid off because Nero was found a week later in an area that I'd already covered. My advice is, don't give up. Keep covering the places you've already been because your pet might by lying low, waiting for the courage to come out.